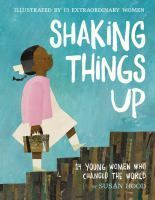 Susan Hood has written over two hundred children’s books, and her most recent is Shaking Things Up: 14 Young Women Who Changed the World (Harper). 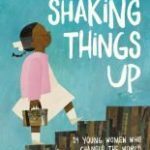 The author introduces readers to women and girls whose accomplishments are inspirational to people of all ages and genders. There is a timeline of those featured that ranges from the 1780s to 2014. Right after the American Revolution, Molly Williams, a servant of a volunteer firefighter, hauled a pumper truck and fought a blazing fire on her own. Molly was awarded a volunteer badge, but there wasn’t another female firefighter in New York City until 1982. Malala Yousafzai received the Nobel Peace Prize in 2014 for standing up to the Taliban and declaring that girls had a right to an education. Susan Hood writes about twelve other scientists, artists, athletes, and ordinary women and girls who believed in themselves. The illustrations in Shaking Things Up are by a number of noted artists. Over the years, politics, religion, and “polite society” have tried to define what a woman should be, tried to restrict our behavior, speech, rights, aspirations, and even choice of clothing. But women have faced adversity head-on – defying poverty, illness, war, and discrimination – to change the world for men and women alike.